Jackson had a routine heel prick and the nurse placed a band-aid on his heel. When the band-aid was removed the next day, all the skin on his tiny foot tore off with it. Since that day, we have made it our mission to support the brilliant research focused on finding a cure for EB that will give Jackson, and others afflicted with EB, a chance at living pain-free lives. blistered and his mouth bled when he drank from a bottle. The elastic in his diapers tore up his thighs. By the time we took Jackson home after two weeks in the NICU, his body was covered in bandages. ​ At the time of Jackson’s birth and currently, there is neither a treatment nor a cure for EB. The only way to “manage” the disease is to wrap Jackson’s body in non-adhesive dressings to try to reduce the chance of injury and infection. In spite of this serious diagnosis, Jackson has thrived beyond doctors’ expectations. With the proper protective bandages, he is able to go to school, play with his peers, and swim, though it is rare for him to make it through a day without sustaining a painful injury. His hands are scarred from repeated blistering, his knees, heels and elbows are always bandaged and, all too often, his esophagus tears from eating, but it does not dampen his spirit. 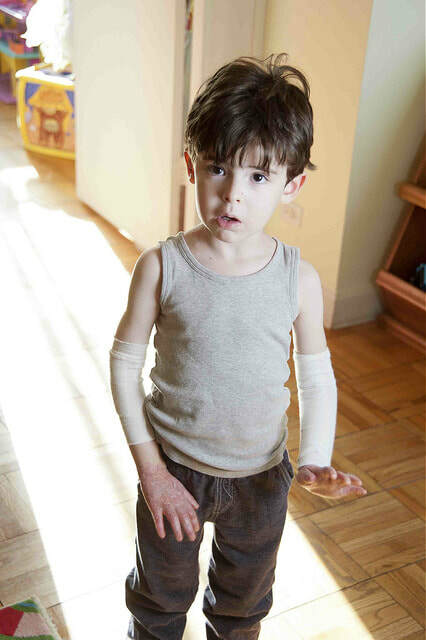 During his daily bandage changes, we witness how much Jackson’s little body has to endure. No child should have to sit through lengthy bleach baths or fear that food will hurt him when he swallows. No child should have to worry that if he falls, his palms will become giant blisters filled with blood. No child should have to know about needles and syringes. We are continuously partnering with the research community to ensure that Jackson can lead a long and happy life, free of the burden of EB.